The Really Kid Friendly Blog: Toy Story Playland - Now Open! Planning a short trip to Paris? 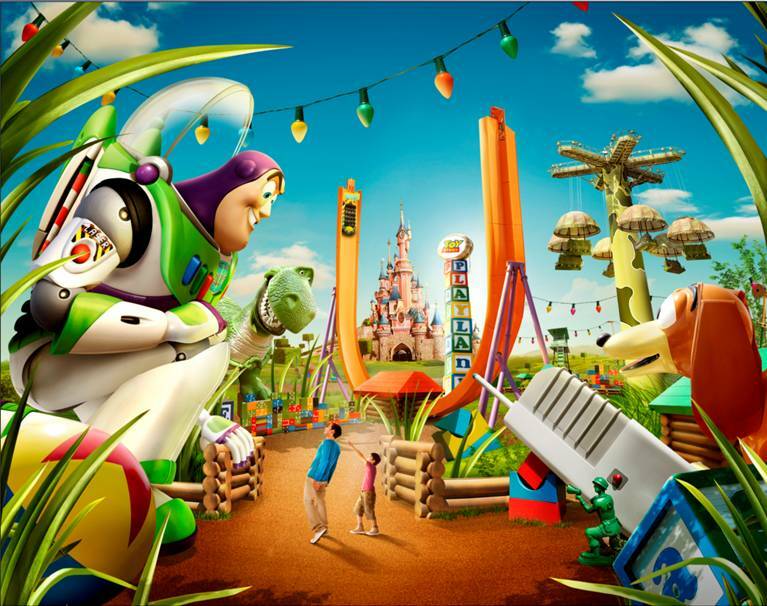 We're very excited about the grand opening of the new Toy Story Playland, and are sure you will be too. Have a read of the press release below, and also check out this great round-up of child friendly places to go in Paris by French magazine The Smallers. Today guests will feel as though they've been shrunk to the size of toys as they embark on family-friendly adventures with Buzz Lightyear, Slinky Dog, the Green Army Men, RC Racer and the rest of the gang from the Disney·Pixar Toy Story films in the all-new Toy Story Playland at Disneyland Paris. Dwarfed by giant blades of grass and oversized toys, guests can descend 27 meters on a simulated parachute drop, race round-and-round on a zany coaster and zoom through a 25-meter half-pipe Hot Wheels® track aboard a remote control car. They're all part of a new outdoor play area inspired by the backyard where Andy, the boy from Toy Story, took his toys to play—except here guests will feel as if they're the same size as the toys. "When you are in this land, nothing is human scale and everything is made of toys," Chrissie Allen, senior show producer, Walt Disney Imagineering, says. Benches are fashioned from Lincoln Logs®, a wall is constructed of dominoes and a four-meter-tall Buzz Lightyear action figure greets visitors at one of the entrances. Strewn along the wide walkway are giant Tinkertoys®, Lincoln Logs®, a ball and jacks, children's blocks, a balsa wood plane and other nostalgic playthings, lit at night by oversized holiday lights. Andy's enormous but subtle footprints are found in the walkway, reinforcing the notion of scale. To help create the sense that guests have shrunk to the size of toys, Disney Imagineers took advantage of a more than 100-year-old forest that edges the play area. The trees, many more than 30 meters in height, tower over Toy Story Playland. "The landscape naturally reinforces the sense of being immersed in this play world," Chrissie says. "The new land is planted with beautiful stands of 9-meter-tall bamboo which encloses the land and seals us into our new toy world." The "grass" is actually tightly planted New Zealand flax that mimics a manicured lawn. There are two entrances. At the main entry is the giant Buzz Lightyear action figure standing proudly on a pile of blocks. At the second entrance at the other end of the land, monkeys from a giant blue Barrel of Monkeys® welcome guests with letters from a Scrabble game. Press release from Disneyland® Paris. All images are property of Disneyland® Paris. 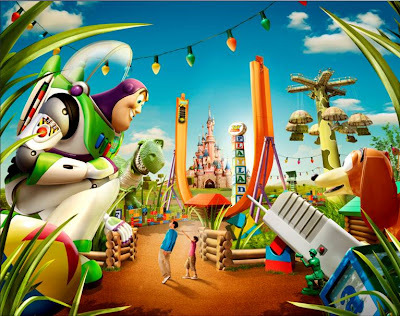 Disneyland Paris is offering 40% off, and kids under 7 stay and play free. Click the enormous banner at the top of the page for more info and to book tickets.